I confess to splurging on makeup; usually base and mascara as that's what I wear on a day to day basis. Saying that, i'm just not the type to spend a lot on makeup brushes, applying most products with my fingers..
Seemingly like most of the beauty community, the Real Technique brushes, I just cannot resist! Their 301 Contour Brush is a densely packed, short bristle brush with a rectangular/oval profile, great for stamping onto the cheeks and dragging inwards to create the perfect contour/highlight. 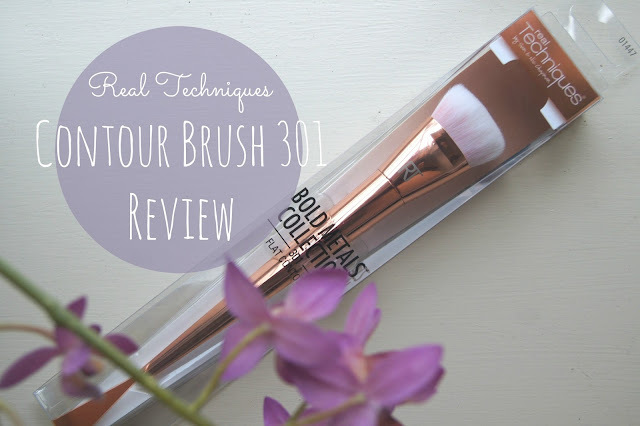 The brush head is super soft and the synthetic fibres, I've found, work brilliantly with both powders and creams. The rose gold handles are nice and weighty and aesthetically divine but pick up fingerprints so easily which, I can't deny, niggles me. I use mine for a little bronzey-ness through the back of my cheeks but mainly for highlighter; it has the perfect proportions for effortless application onto the cheekbones. If you've been umm-ing and ahh-ing, hesitate no longer! This brush is worth every penny of the £22 price tag. Sounds like a great brush, I've already got so many though so doubt I will purchase it! Ive been wanting this brush for such a long time, I think you have totally convinced me to bite the bullet and get out there and buy this thing! I really want to get these new metalic brushes that are now on the market. :) But as I have a contour brush already I don't feel like this purchase is justified.